There are innumerable genre, techniques, styles and forms which temper the musical spirit. In my experience, I have found that the one common trait among all truly great musicians is an openess to at least examine all of it. This page is inspired by the many incredible musicians, fellow-guitarists in particular, with whom I have worked or met and our mutual asthetic interest in the guitar and its magic. Having a special impact on my "guitar psyche", all the Kings (but especially B.B. ), Robert Johnson, Elmore James, Jimi Hendrix, James Brown, Ray Charles, Hank Crawford, David Fathead Newman, James Burton, Steve Cropper, Mike Bloomfield, and many great contemporary players, eg. Eric Johnson, John Scofield, Pat Metheny, Paco de Lucia, Pierre Bensusan, Lowell George, Ry Cooder, Buzzy Feiten, and so many others for whom I have great admiration. In particular, I have to mention the late Tippy Armstrong, a virtually unsung guitar champion from Tuscaloosa, Alabama, who performed an enormous body of session work in Muscle Shoals during the '60's. Tippy had a "touch" all his own and my intention is to begin a page dedicated to him, including soundbytes. Tippy could grasp the essence of virtually any style of music and perform it in an amazingly convincing way. I've been accumulating a nice volume of anecdotal info from those who were around him most. Incidentally, Tippy sold me my first electric guitar, a Fender Musicmaster that I wish I hadn't parted with. (Note: Tippy's tribute is now available. Link: Tippy Armstrong's myspace tribute. Through the years, I've acquired a relatively small collection of acoustic and electric instruments. Generally speaking, they are mostly stock, original issue, and vintage. The quality and spirit in these older guitars is difficult, if not impossible, to replicate. However, some of the manufacturers are really giving it their best shot. Most musicians would agree that beyond their intended purpose, musical instruments are "works of art" and admire them as such. I certainly do, and so I've included a few of my personal axes that are especially appreciable in that sense. I hope you enjoy their beauty as much as I. 1959 Gibson Les Paul Sunburst- Actually "honey burst" now, I bought this baby from Gary Richrath (of REO Speedwagon) in around 1972. Although I'm cautious about taking this one out much given its current appraised value, I use it in my studio frequently. 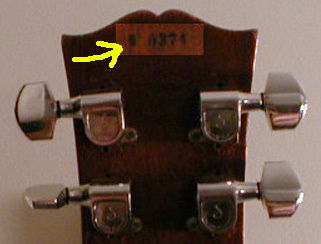 There's a shot of the serial number stamp which I highlighted to make visible on the rear of the headstock. The bridge has been substituted with an aftermarket bridge that has a much greater range in the saddle travel for improved intonation. As well, the tuning pegs have been replaced and the pick guard removed. Naturally, I've kept all the original parts. 1963 Fender Stratocaster-This one came via Bernie Leadon (former Eagle's guitarist) in a straight across swap. He wanted my 1963 Telecaster, and I wanted his Rosewood neck '63 Strat. This is the guitar that I gig with, for the most part. It has been modified to the extent that I had it painted (it had a real hack spray paint job previous to my acquiring), and I put some Tele knobs on it for better volume swell control. At that time, we were unable to find the color match I wanted, baby blue vintage. But through an ingenious luthier who's name escapes me, we found a very close match at a local VW dealer in Santa Monica... yep, Volkswagon paint. Otherwise, it's stock. I find it, and Strats in general, to be an extremely versatile guitar that adapts well to many musical styles. It is particularly suited to the Billy and the Beaters gig I play in the L.A. area. 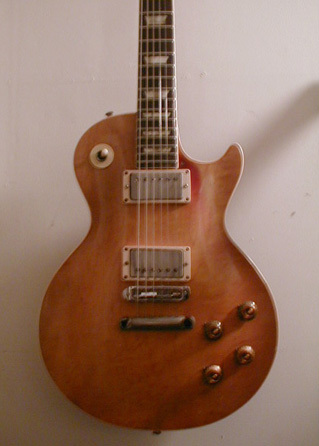 1970 Les Paul Deluxe-Not necessarily a "hot" guitar in terms of its popularity, but I feel this axe delivers some very special tonal qualities with its "Mini-humbucker" pickups. I purchased it as new back then and primarily use it for an open E-tuning bottleneck guitar. 1959 Gibson Les Paul Special-Cherry Red and mint with stock black Gibson "soapbar" pickups and a very sweet rosewood neck. 1968 Gibson ES 335->Again stock with red finish...and Humbuckers. 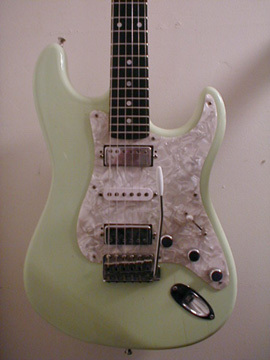 1984 StratoRixter-a guitar assembled (by Greg Loeb, Los Angeles, CA.) according to some ideas I had for an instrument that would incorporate the elements needed to give me access to most of the tones I use in my playing and that also had a neck best suited to my playing. I think we went through around 125 necks before finding THE one. The guitar is primarily a Strat style ESP body and ESP ebony neck with two original Mini-humbucker pickups in the bridge and neck positions and a "stacked" Strat pickup by D'Marzio in the middle position. I use the conventional Fender vibrato bar. This axe has a wide range of tone that it has surprised a few people listening to it recorded and thinking it was an L5, Strat, etc. Yahama Electric Guitars-an assortment of "endorsement" electric guitars. 1950 Gibson J-45-Certainly one of the more popular Gibson acoustics and with good reason with its identifiable classic sound. This is the same model I put my hands on for the first time when taking some lessons as a kid. (? )0018Martin-Stolen several years back, but remains my all time favorite acoustic that I have owned. 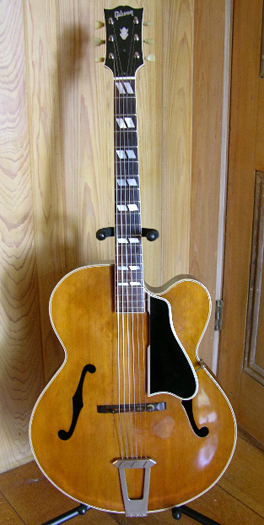 This guitar was used on a few of Wet Willie's earliest studio recordings. I hope to replace it one day. 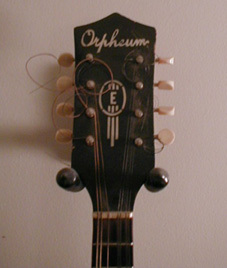 Orpheum Mandolin-First made by Oprheum, a company that existed from around 1875-1910 and made mostly banjos and an oddity called the "banjolin" They then sold the company to a manufacturer named Ruttberg and Lange who continued to make the Orpheum instruments until the 1960's when a Japanese company bought the name. If anyone has any more information, please send it too me. This is a very beautiful sounding instrument. 1976 Aria Pro II-Another endorsement, I've held on to this one. 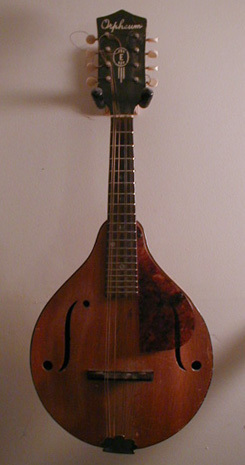 It was inspired by the big dreadnought Martins although it sounds completely different. Has more of that Gibson Jumbo quality. 1979 Ovation Legend-An endorsement also, it records direct very nicely for this genre of guitars (acoustic electrics). Stereo pickup and stereo/mono outputs, tone and volume. Yahama AEX500N-A classical guitar hybrid with a thin body, f-holes, a narrow neck and onboard pickup and eq. Great for recording direct, it can deliver a nice classical sound, and therefore good for quickie sessions where I want that sound without a lot of mic placement. 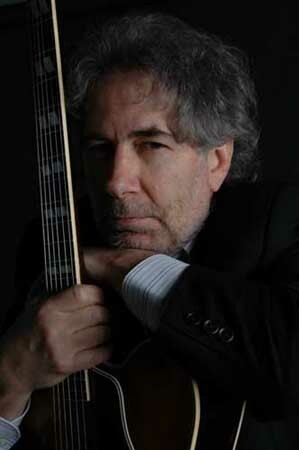 It would be quickly dismissed by guitarists whose niche is strictly classical or flamenco. Mesa Boogie Amp (Mark I)-The serial number on this workhorse is #083. It was purchased from Randy Smith (Mesa Boogie founder) in 1973. It has been around the world in its flight case on multiple occasions and survived the gorilla tactics of every roadie that ever tossed it, even falling off the back of a moving truck in one instance. I have had to transfer the "guts" to a new chassis, but otherwise it remains the same amp, except for tube replacement and light maintenance. Pignose 150R Crossmix-A solid state amplifier designed by Paul Rivera for Pignose and who now has his own line, Rivera Amps. This is one of the most versatile amps I have played through. It has channel switching and a couple of pre amps that deliver the widest range of guitar tone one could ask for. I now own four of them, and if anyone has one to sell (in decent shape), you should email me. The Crossmix is only used as a recording amp. Pignose 60R Studio-Another solid state amp that again delivers a wide spectrum of tone versatility. Great for live in small venue setting. Ampeg V4-I have to include this amplifier although I haven't had one in many years. Reason it is mentioned is that many guitarists have asked me about the tone heard on a live Wet Willie album, Drippin' Wet. This was the amp used playing a Les Paul Deluxe.